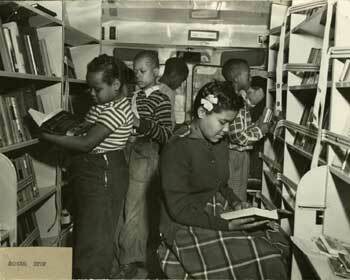 There’s nothing better than pictures of bookmobiles. Running a close second, though, are pictures that capture wacky (but totally awesome) clothes. Put them together, and you have my own personal kryptonite: bookmobile fashion! A while back, I compiled some great examples. But there are so many amazing bookmobile pictures out there, with so many amazing bookmobile fashions. So I’ve gathered a few more for your enjoyment and edification. Learn from the masters and get ready to look fan-freaking-tasting on your next library visit. Look at all these prints! The checks-with-polka-dots-of-some-kind is pretty great, but I think my favorite is the stripes, especially the way vertical skirt stripes echo the book spines and the horizontal bodice stripes echo the shelves. Perfect bookmobile attire. From the Montana Historical Society Photograph Archives. Source. Check out that quality outerwear! When you visit a bookmobile, you have to factor the cold into your outfit more than you might at a building-based library (even if the bookmobile has interior shelves, since the heating may be a bit more uneven). And these young women have it figured the hell out. Especially the star buttons on the jacket on the left and—yes yes yes!—whatever magic is happening in the middle. Is that a hood? Is it a weird fuzzy flap? Who cares! It’s glorious. From the Mount Vernon Public Library. You simply have to respect someone who can mix denims with such panache. I bet she’s a librarian. They know what’s up. And if you don’t have stripes to wear, there are other options. Dragon visits San Francisco Public Library. From sfpl.org. So next time you get gussied up to go to the library (you do gussy up, yes? ), take your cues from these bookmobile patrons. You won’t regret it.